The Drusilla scoop neck sweater! 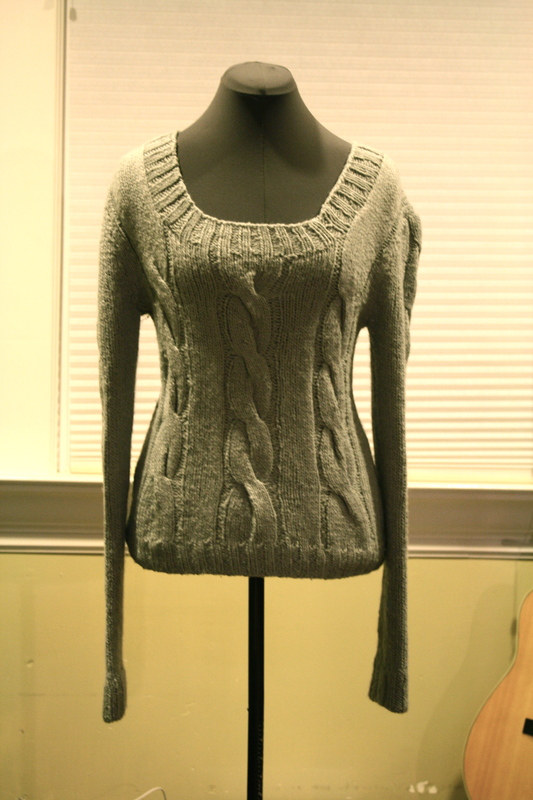 This charcoal grey sweater features a cabled body that rises up to a broad, scoop neck to be worn over a tank top or a button-up blouse (for those of you wanting to wear this to a more formal occasion). The sleeves have an elegant single cable descending from the shoulder and end in a k2p2 ribbing, matching the neckline and the sweater’s hem. The Drusilla was knit on size 10 circular needles, working in a round from the bottom up, and then splitting into two flat panels when reaching the edges of the sleeves. The sleeves are also knit flat, and then sewed together afterwards. The neckline was knit separately from stitches picked up after the front and back panel had been sewed together. 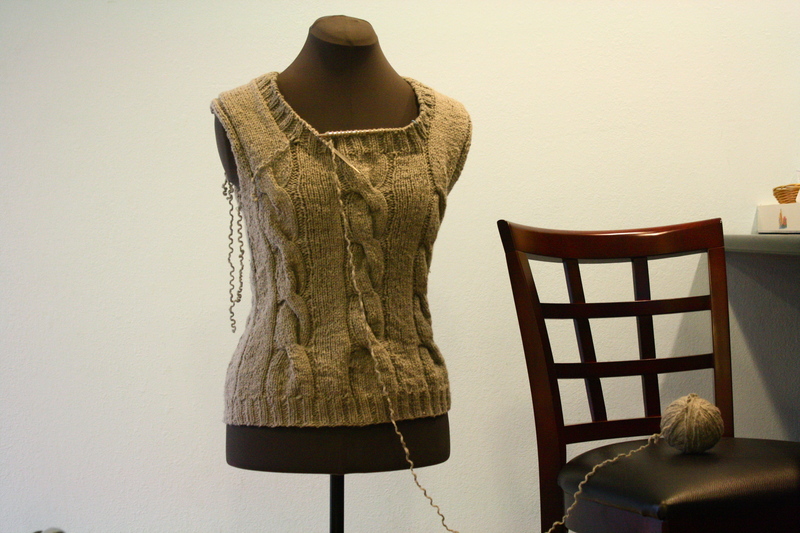 TL;DR – I knit this sweater. An in-progress picture, before blocking or sleeves. The Drusilla languidly lounging on my piano bench. I kind of don’t like to look at this picture too long because it makes me feel really weird inside. Out of consideration for you, I’ve made the image smaller than its original. This being the very first sweater that I (semi)designed myself, there are clearly some things I can work on and learn from this. Firstly, I need to learn how to do a neckline. This sweater was not intended to be a scoop neck (didn’t even know scoop neck was a term to describe clothing until I made one), but it just happened to turn out that way. Secondly, while recycled yarn may be good for scarves and whales and such, knitting a sweater with already used yarn may not be the best idea. For those of you who knit with recycled yarn, you know that the yarn already has the shape of the original stitching in it, which will mess up how your stitches look when you reknit it with a different size and pattern. And blocking the work can only do so much. 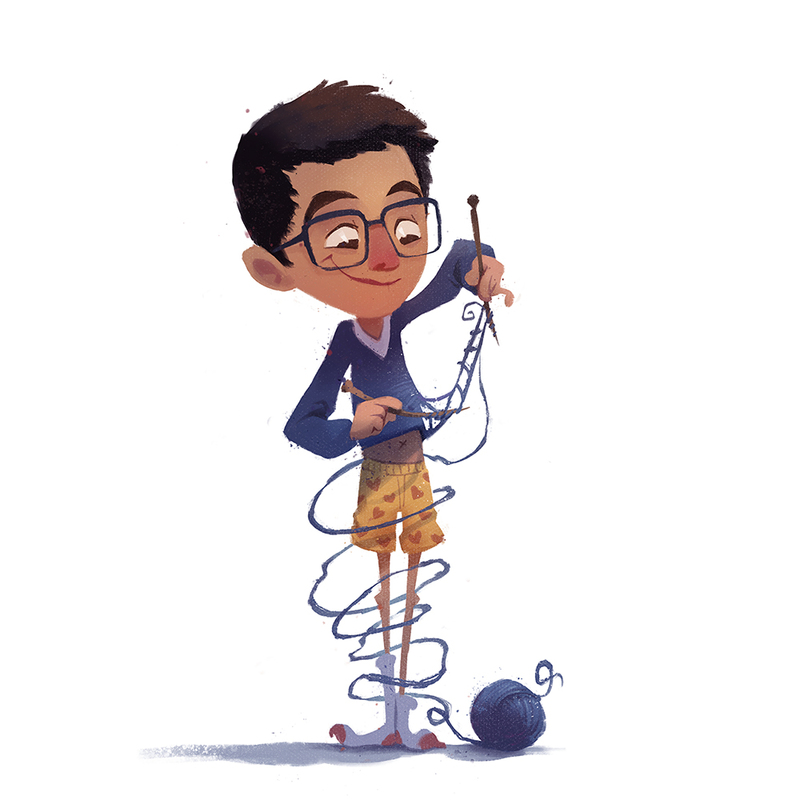 So, what’s a knitter to do? Iron it. What? Yes. That’s right. Iron it. Iron what? Iron the yarn? Really? Yes. Iron the yarn. What? Yes. Iron it. Essentially you are blocking the yarn before you knit it. Ironing is probably the harshest way of blocking (so best not to do this with fragile material), but it’s effective. If you take a straightening iron (another thing I found while going through my sisters’ stuff) and pass your yarn through it at a steady pace, all of the twists will be gone and it will literally be good as new! However, this method of renewing your recycled yarn takes awhile, so I only suggest doing it if you a) have a lot of time on your hands (aka a LAO (Law & Order) marathon) or b) you found really nice yarn that’s perfect except that it still has the shape of what it previously was. Now the question you all may be asking right now is, why would I call this sweater a Drusilla scoop neck sweater? Well, I’ve always found the names people give their patterns (e.g. 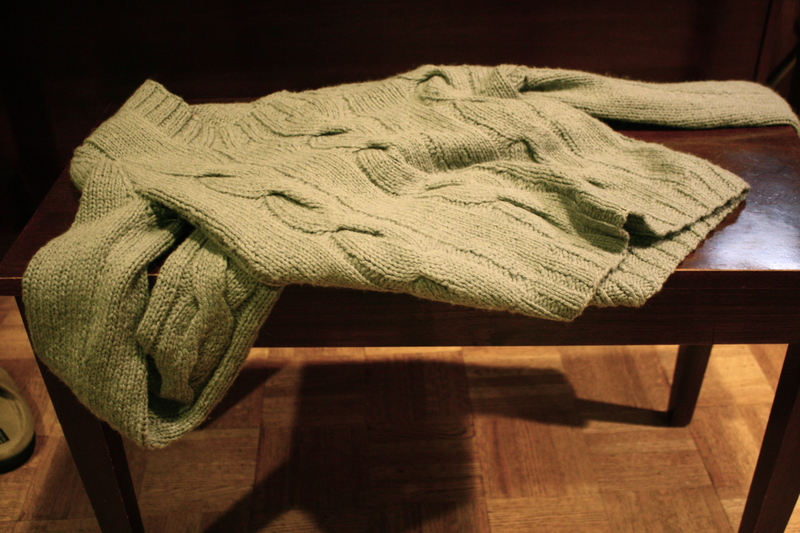 Puerperium sweater, Maile sweater, Gentle Wake, Driftwood, River Crossing, etc.) ridiculous and arbitrarily chosen. So, as an affront to that, I have decided to make the name of my sweater 100% reasonable and relevant. The bulk of this sweater was knit while I was reading Wilkie Collins’ The Moonstone (great read. I suggest it to everyone. ), and I decided to dedicate this sweater to one of the characters from this book, Drusilla Clack, who is an uptight conservative Christian who plants tracts around peoples’ houses and would be utterly offended by its ostentatious neckline. Surely a good Christian would know to wear something more decent and not tempt others with the sins of the flesh. 1) Clogs, Birkenstocks, and Skechers everywhere. No joke. Despite the fact that doctors are getting younger and younger, their footwear still seems to stay around 20 years older. For the first time (surprisingly) I may have been the most stylish person in the room. I think part of the reason why this is is because it’s easier to wipe blood off the sleek leather surface of a clog than to worry about getting your brand new Clarks painted red. 2) People get bored. In most episodes of House you’ll see the doctors fast at work throughout the whole surgery. What you don’t see are the residents pulling out their romance novels, iPhones, and Kindles while they wait for a team to come from another surgery. You also won’t see people sending pictures of the surgery and texts saying, “I’m in the OR (short for operating room. It’s doctor lingo. Don’t worry, you’ll catch on soon.) right now!” to their friends. 3) Blood is messy. In brain surgeries (I’m not sure about other procedures), there is large plastic bag that basically acts like a bib for blood. A blood bib, if you will. And often, the pocket where all the blood gets funneled into fails to open properly, resulting in blood pouring all over the floor. Many times I’ve tried to get myself close enough to the patient so I could get a little blood spatter on my scrubs (I call it earning my stripes. Other people call it gross and unhygienic. ), but so far no such luck. And regardless of how well the surgery goes, the room afterwards still looks like a scene out of Saw. ***Trigeminal neuralgia, also known as Suicide Disease, has been described as inducing one of the most severe pains a person can experience. It originates from the trigeminal nerve and can affect all areas of the face, including the ears, eyes, forehead, and jaw. Thanks for putting out more information trigeminal neuralgia on the web. We hope raising awareness leads to a cure!